Prepare a high fire (500ºF to 550ºF) in grill for direct and indirect cooking. For a charcoal grill, bank the coals on one side of the grill, leaving the other side empty. 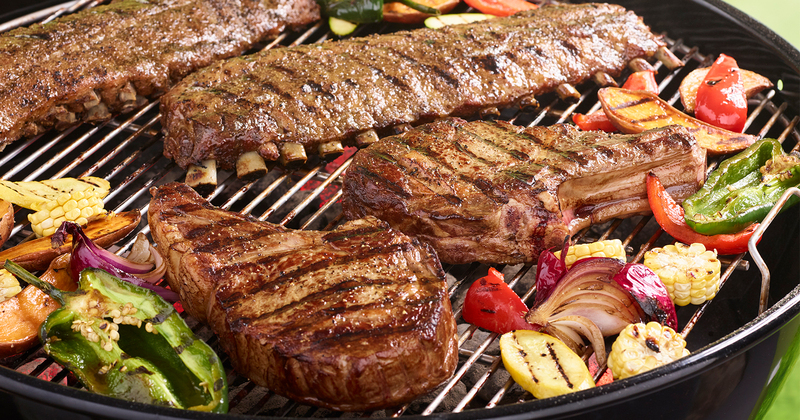 For a gas grill, preheat the grill on high, and turn off half of the burners to leave a cooler area. Coarsely crush the peppercorns in a mortar or under a small heavy saucepan on a chopping board. Press evenly onto Open Prairie Angus beef ribeye steaks. Place steaks over direct (hottest) area of grill and cover grill. Cook, turning once, until seared and browned, 8 minutes total. Move to the indirect (cooler) area of grill and continue cooking, with the lid closed, and without turning, 15 to 20 minutes for medium-rare. Transfer steaks to chopping board and let stand for 3 to 5 minutes. Carve steak off bone. Cut across the grain into slices, season with salt, if desired, and serve. Serving Suggestion: Enjoy this steak with a mixture of grilled vegetables, such as zucchini, yellow squash and miniature sweet peppers.